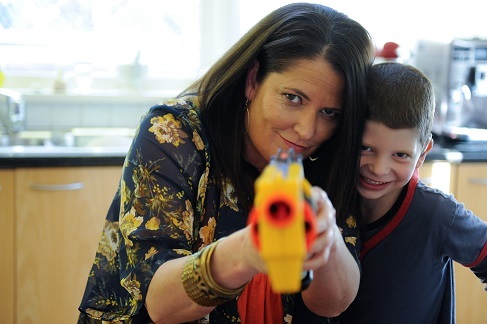 Mum vs Life: I live in chaos, but it works for us! This week we talk to Mrs Woog of woogsworld.com. Mrs Woog is a successful Sydney-based blogger and author of the book Mrs Woog: Tales from the front line. She is the mother of two boys, a cat and two guinea pigs. She was one of five &apos;mummy bloggers&apos; invited to an intimate dinner with the PM. Mrs Woog takes us through her crazy day and offers us absolutely no time-management tips. We love her! I wake up at 2.30am to do half an hour of thinking, listening to strange sounds and a bit of worrying. I am then rudely awoken at 7am and nagged for a bit before I rise. I would describe myself as NOT a morning person, although I do envy those who get up, drink something green from an old vegemite jar and then go for a run. Once I get up, I head straight to the coffee machine, where I give thanks to caffeine. I eat a piece of toast and a piece of fruit. I am not a huge fan of breakfast but I know if I don’t eat something, I will go on a massive eating rampage at about 11am, where I am likely to make some extremely unhealthy food choices. It is a bit of an insurance policy. I wish I started my day with yoga in my undies listening to soothing music before I consult my checklist of work and duties for the day, but truth is you are more likely to find me running around trying to locate school hats, making lunches and signing notes. Oh and yelling and pleading with children. What an extraordinarily mundane question, of which I am delighted to enthusiastically answer. I sleep well when I am straight from the shower to the sheets. I like going to bed really clean, and moisturised. A quick “top and tail” in the morning and I am as fresh as the proverbial day. Things to take into account when selecting my daily wear are… what is clean! If it is on the floor, it gets the sniff test. I hate unnatural fibres and I hate being uncomfortable. I am a big fan of layering so you will always find me in slips and t-shirts and cardies with jeans or cargoes. If I need to leave the house, I whack on hoop earrings, a scarf and lippie. I work from home. It can be from a couple of hours in the morning to a full on day-into-night scenario, depending on how much world is on. I almost always run very close to deadlines and write better under pressure. I think about a lot of good projects, but am useless at following through with them. Ideally, I will walk the kids to school, come home and put some washing on, bash out a few hours of writing. Then pick up the kids in the afternoon and from then on. It is tools down. I get enormous satisfaction from my job, which evolved from nothing. Which in itself is a bit of a miracle and one that I am always grateful for. I have no idea how I got here. Seriously. My work environment is my home, and right now it is FREEZING so I will enjoy it more when I get the heating sorted out. I hate being cold. I try to get out and about as much as possible though, as I can get a bit of cabin fever now and again. My work space is a desk, chair, lots of window and sunlight, French doors out onto the garden and the ever faithful Big Bertha Apple Mac. My “café” is in the next room. I try to have just breakfast, lunch and dinner but sometimes hot chip cravings come a calling. I have a Cafitaly machine and try to keep it to two cups a day. Does Candy Crush count as exercise? No? DISAPPOINTED! I loathe the gym. I walk for half an hour each day to the point that I get huffy puffy. My oldest son tells me he will take over the site when I am too old, so that should be interesting to see how he will manage a community of smart, funny women. The love the perks like travel. I just tell them, as far as their own careers, to find something you love doing and see how you can make a living out of it. I have ideas where they will both go, and I cannot see them working in an office. But who knows! I love to eat out and the kids have been eating out for years, so it is fun to take them. We eat dinner together everynight at the table, where we play a game called “Best and Worst.” You have to nominate the best thing about your day and the crappest thing that happened. It is a great conversation starter. Except for when they say that the worst thing about their day is the dinner I have just cooked for them. This happens mainly when I cook vegetarian food. I end my day the same way I start it, looking at a pile of washing. I would NEVER feel guilty about paid help! I wish I had more…. We have a very supportive family who are great babysitters and who are more often happy to pitch in at times of complete craziness. My husband is quite flexible in his work, so picks up the slack when I travel for work or are at meetings after school hours. Most of the time, I can fall asleep quite easily. Tea and reflection would keep me up for hours! I like to get the kids off to bed, spend some time with Mr Woog, read some of my book. I find if I read in bed I sleep better. Sometimes I will tweet a bit or read some blogs. Or sometimes I will just crash like a demolition job. You are talking to the wrong girl. I am useless at all things time management. I live in chaos, which works for us! I can be found in the laundry, folding laundry, sorting laundry and dropping off the dry cleaning. 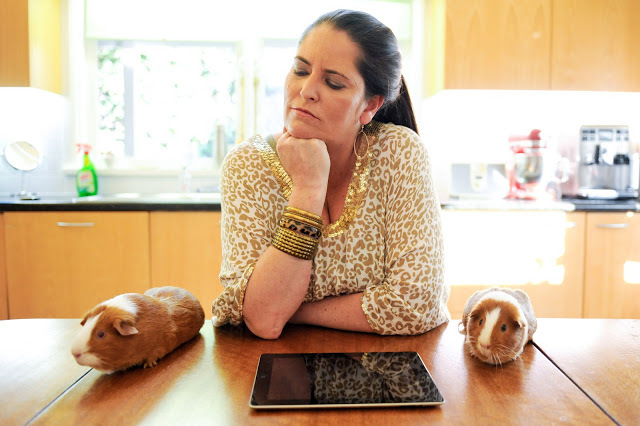 I am mum to two boys, advisor of my husband and master of a cat and two guinea pigs. I am a procrastinator, avoider of conflict, an average cook and of course, I am a blogger. I like to read cookbooks and eat out. I like to critique fashion magazines while wearing tracksuit pants on the couch. I do not like Pina Coladas, nor walks in the rain. I will take a gin & tonic in front of an open fire every single time. During my waking hours, I ferry kids around in Sonia Kluger while drinking takeaway coffees and listening to talkback. I think about going to the gym every day.